It often happens that our beautiful bleached blonde hair becomes brassy after a few shampoos. The color fades and some unwanted yellow or orange tones begin to show. Sometimes also right after the coloring the shade is warmer than you wanted it to be. Of course, you can use another bleaching product to fix it, but it would be much better for your hair to use a simple hair rinse which does not affect the hair structure. 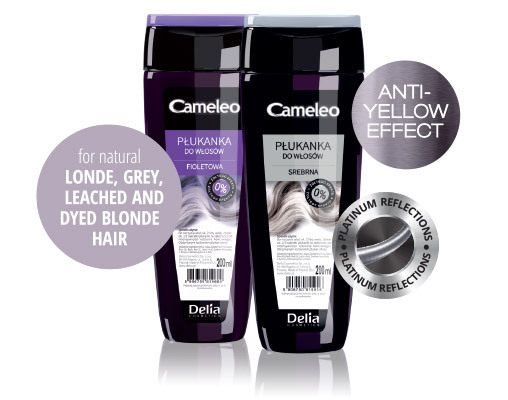 The hair rinse of your choice – silver or purple – from Cameleo will not only take the unwanted tones off your hair, but also leave it glossy and shiny – after the first use! Due to the light formula, Cameleo Hair Rinse does not weigh your hair down and can be used on everyday basis. The product is recommended for blonde, silver and bleached hair to remove brassy tones and cool down the color. If you dream of a long-lasting cool blonde, Cameleo Hair Rinse is a must-have for you. Depending on the effect you desire, you should choose the right color. The silver rinse leaves – as the name suggests – silvery and platinum tones. The purple rinse will cool down the yellow tinges to more blueish shades. Prepare a two-liter container (a jug, a pot, etc.) and fill it with water to the brim. Pour 1 tablespoon of hair rinse into the water and stir until the color is even. Rinse your washed hair with the mixture and enjoy the effects! You can use Cameleo Hair Rinse after every shampoo. But remember to follow the instructions carefully – the intensity of the color depends on the amount of the hair rinse you pour into the 2 liters of water. Cameleo Hair Rinse is a safe and easy way to rescue your blonde hair! Safe decoloring treatment – it’s possible!